It truly is amazing how many unique gifts can be found in Hendricks and Morgan counties. For a second consecutive year, we are showcasing all of our local shops through our One-of-a-Kind Finds Online Gift Guide. I personally have been out to most of these stores helping decide what gifts we would feature, and I was blown away by what we discovered. This post focuses on the kids and has a little bit of everything. But even if the particular item we feature may not be exactly what you&apos;re looking for, we suggest visiting each of these small businesses as they just might have that gift idea you thought you would never find. When I perused the local, handmade section at Frazee Gardens, 3480 N. Ind. 267, Brownsburg, I was immediately drawn to these amazing head wraps and hats that any young girl or boy would love to own. Made by Sandy Hunt, we saw one head wrap with a Frozen theme as well as popular braided, ponytail hats. You could just tell by looking and feeling them that a lot of painstaking work went into making each one, and the quality was exceptional. Ranging from $20-$30, these handmade creations were even more affordable than I expected. Back by popular demand, Promise Monsters, which you can find at Wilbur&apos;s Lincolnwood Toy Store, 285 W. Main St., Brownsburg, remain one of those gifts we had to feature for a third consecutive year. 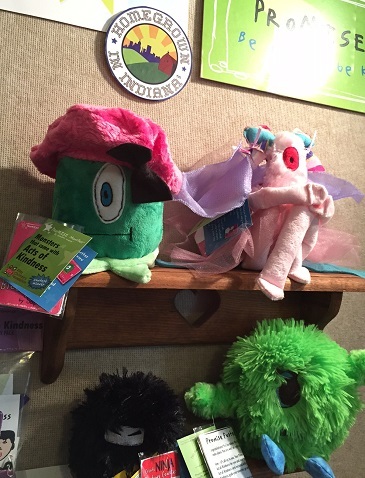 These cute stuffed creatures, which line one wall of the store, are made locally in Hendricks County and include a secret mission of kindness that the child can do to earn points for accessories. For $29.99, you can purchase one of the monsters: Frank, Spike, Albert, Bride of Albert, Blobby Katy or Squiggly; and also receive a random act of kindness mission. You can also purchase more missions at Wilbur&apos;s Lincolnwood Toy Store for $5 each or a smaller monster known as a Smarshmallow for $9.99. We would encourage all parents to check out Wilbur&apos;s store as they have a vast array of specially chosen toys that all have one thing in common, according to the owners: "Play value." Located in Downtown Coatesville, Enchanted Journey, 8022 Main St., will once again take you back to simpler times with their well-made wooden toys with varying price points that would be perfect for any child. The toys, which are handcrafted, include small, simple cars that sell for $3 each or two for $5. However, we were intrigued by a bigger semi hauler carrying cars that fit in an interlocking puzzle. The colorful and creative toy sells for $40. They even have one-of-a-kind wooden puzzles made in the shapes of animals that were amazing for $20. We spotted some unexpected, great handmade, stylish kids clothes at Kids Go Round, 2481 E. Main St. in Plainfield. Made by Sugar Baby Boutique, you won&apos;t believe the creativity and various styles. Prices were affordable but varied depending on the style and size of the clothing. When we walked into The Sterling Butterfly, 190 E. Morgan St. in Martinsville, which is part of our Rural Routes to Main Street Cultural Trail, these soft and cuddly little sock animals jumped out at us. Featuring bright colors and cute faces, your child will quickly fall in love with them. I can just see my little one taking his to bed at night. Made by local artisan Nancy Maxwell and also featured at the Art Sanctuary, 190 N. Sycamore St., Martinsville, these little critters are oozing with the cuteness factor and are reasonably priced from $20-$28. What little girl doesn&apos;t love a good doll? Well, we found some that were so lifelike at Main Street Dolls ‘n More, 49 S. Jefferson St., Brownsburg, that we had to add them to our gift guide. This store has an amazing selection of dolls at virtually every price point, but the ones that caught our eye were the Lee Middleton Babble Baby selection because of their lifelike appearance and feel. This particular baby doll also makes baby sounds by reacting to the sounds and movements. The dolls are battery operated. The store owners tell us parents love them almost as much as their children because any 0-3-month clothing fits these dolls making their accessories cheap. The dolls come with adoption papers and a Bible and cost $119.99. If you decide to purchase one of the baby dolls above then we potentially found a great place to purchase some additional clothes. Enchanted Journey in Coatesville has affordable baby doll clothes that measure 15 and 18 inches and do fit the popular American Girl dolls. The clothes range from $10-$16. If you want to provide something different this year that could make a memory for not only your child but your entire family, we suggest you consider adding a uPaint Pottery Studio experience to your child&apos;s holiday wishlist or perhaps even go before Christmas so your child can make a gift for a grandparent or other loved one. This pottery studio, located at 1820 E. Main St. in Plainfield, allows the child to pick out their own piece of pottery from a wide assortment of options including bowls, cups, figurines, animals and much more and then gives them the opportunity to paint them however they wish. The best part is the folks at uPaint clean up the mess when you&apos;re done, and you don&apos;t have to worry about getting paint on your table or floors at home. The pottery ranges in price from $5-$80, and a $5 studio fee is also charged to cover the cost of paint, brushes, clean up, etc. A final glaze and fire in the kiln is required so you don&apos;t get to take your new creation home that night, but can pick it up in a few days or have it mailed to you.